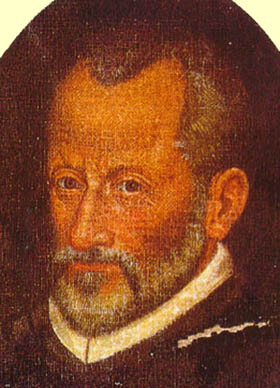 Giovanni Pierluigi da Palestrina was born in 1525 and died in 1594. His surname comes from the place of his birth--a small town twenty miles from Rome. A choirboy at S. Maria Maggiore, Rome, in 1537, he was appointed organist and maestro di cappellaat Palestrina cathedral in 1544 under the Bishop who later became Pope Julius III. After seven years his former summoned him to Rome as chapelmaster of the Cappella Giulia at St Peter's, in which post he served from 1551 to 1554 and again from 1571 until his death His choir here consisted of Italians, being thus sharply distinguished from the choir of the Sistine Chapel, which since Dufay's days and before had been almost entirely recruited from Flanders. 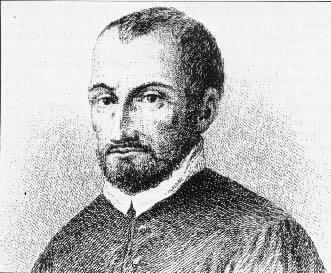 Soon after Palestrina's appointment he brought out a book of masses, which are the first ever dedicated to a Pope by an Italian composer. The fact may be remembered as a symbol of the rising influence of the native school. 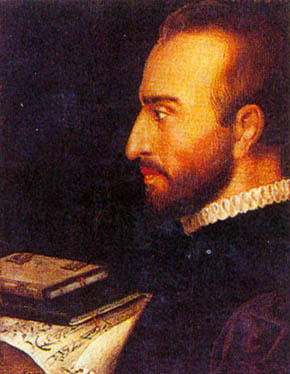 A few years later Palestrina was appointed a member of the Sistine Choir, but was subsequently dismissed by Paul IV because of his unacceptable married status, and was quickly retired with a pension. After other appointments, as choirmaster at St John Lateran in 1555-60, at S. Maria Maggiore in 1561-6, and at the Roman Seminary in 1566-71. As earlier mentioned, Palestrina returned to the Julian Chapel in 1571 as chapelmaster, remaining there until he died in 1594. In the 1560s he had also directed concerts at the Tivoli villa of Cardinal Ippolito d'Este, and had a Mass commissioned by the Duke of Mantua, who tried to persuade him to leave Rome for the Mantuan court. 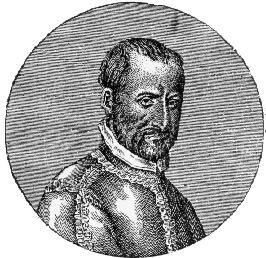 Though he was hardly at all employed as a musician in the Papal choir, much of Palestrina's music was destined for performance by it. His output contains 105 Masses (a remarkable number even for that period), some 250 motets, several volumes of specific liturgical works (Offertories, Litanies, hymns, Magnificats and Lamentations), two books of madrigals and two of spiritual madrigals. His preference for writing Masses and for remaining in Rome within the orbit of the Papacy marks him as a man of conservative inclinations, though his style did develop away from the mainly contrapuntal towards more chordal and harmonically orientated writing - a fact often masked by the use of his music today as a model for the discipline of counterpoint. He shunned the pressures of his age towards the expression in music of moods or words, choosing to set even quite highly-charged texts in an abstract, perhaps impersonal idiom possessed of a beautiful equilibrium of melodic line and harmonic euphony. Though he wrote parody Masses on his own and others' pieces, much of his sacred music springs from plainsong, and many Masses are based on Gregorian melodies or on motets themselves so based. His madrigals were, as might be expected, conservative compared with progressive developments in that form. One of Palestrina's closest friends was the saintly Philip Neri, the founder of the Oratorio, and for him he acted as musical director so that whilst we look upon this composer as representing the climax of the school of unaccompanied contrapuntal choral music, one must remember that he has his associations with the new form of music which was quickly to supplant the old. Palestrina, was not a prophet without honour in his own country. In the year of jubilee (1575), when pilgrims of all nations flocked to Rome to obtain the indulgences offered them, a procession of fifteen thousand inhabitants of Palestrina, divided into three great choirs, entered the sacred city singing their townsman's music. In any account of Palestrina's life will inevitably be found some reference to his part in 'saving' church music from destruction by the Council of Trent (1545-63). The incident has in the past been somewhat exaggerated. It had been decreed that church music should be purged from secular influences and methods--as for instance the method of building up a piece of church music upon some popular tune as cantus firmus. Advice was taken with a sort of Committee of eight Papal singers, who demurred on one point, the demand that the words of church music should always be intelligible to the listener. Choral composition was in those days, of course, highly contrapuntal, full of 'imitations' and other artistic devices necessarily in danger of tending somewhat to obscurity; but the obscurity was not unavoidable, and Palestrina's music appears to have been brought forward in refutation of the singers' claim, which might have led to drastic action by the Council. 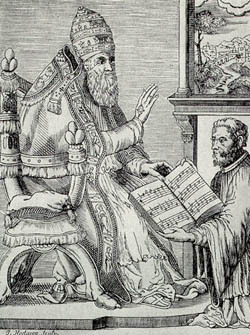 Palestrina's Missa Papae Marcelli has often been referred to in this connexion with the argument before the Council, but its citation on this occasion is not certainly known. The known facts are that Pope Marcellus II died after he had been three weeks in office (1555). As a Cardinal he had been very active in urging a reform of church music. Reform was 'in the air' just then, for Holy Church had lost England, and this was looked on by the devout as a warning. This Cardinal was 'the virtuous prince of the Church whose person was the very embodiment of the principle of reform.' During his brief occupancy of the chair of St. Peter, Marcellus showed his zeal for improvement in church music. Returning on Good Friday from the service at which the Reproaches are sung, he called for his choir and urged upon them the necessity of a proper choice of music in future, with a view to the character of the particular service in which it was to be sung, and also that of letting the words stand out clearly. These were ideals in consonance with Palestrina's spirit as a Church composer, and it was probably with the memory of that Good Friday meeting in mind that, when he printed this Mass (in 1567), he gave it the title Missa Papae Marcelli.